A multi-tenant architecture is designed to allow tenant-specific configurations at the UI, business rules, business processes and data model layers. This is enabled without changing the code thereby transforming complex customization into configuration of software. This drives the clear need for “metadata driven everything” including metadata driven database, metadata driven SOA, Metadata driven business layer, Metadata driven AOP and Metadata driven user interfaces. As the service grows building a cloud database service to manage a vast, ever-changing set of actual database would be difficult. Rules pertaining to whom, where, how etc. may become an overhead as the application and numbers of clients grow. Metadata driven approach involves collecting all these answers in tables so that it could be reused. It involves putting info about all tables, columns, indexes, constraints, partitions, SPs, parameters, functions; rules defines in business and transaction steps in a SP. In a true metadata driven database, no rule and procedure refer to tables directly and even these rules are abstracted and used through metadata. To be a true service-oriented application the fractal model must be applicable from the system boundary to the database, with service interfaces defined for each component or sub-system and each service treated as a black- box by the caller. The metadata-driven nature of the services of application leads the solution to a dead-end if a pure technical ‘code it’ approach is taken. In such a metadata-driven application exposing functions is replaced by exposing metadata. Exposing the metadata itself is not the true intent of a metadata-driven application. Driving the propagation of services [functions] over the system boundary is a more accurate manner of phasing the approach that needs to be employed. A metadata-driven application is capable of providing a bridging approach to propagate its services into many technologies via code generation. This is a direct result of all services being regular and that all service descriptions are available in a meta-format at both build-time and runtime. In the past, business logic and workflow were written using if else condition. If a business model or workflow is being designed in a multitenant environment, then the very first step has to be preparing metadata configurations. It should include the data source, extractions steps, transformation routing, loading and the rules and execution logic derivation source. Next step has to be the decision of tools and language, the usage of which can generate code and workflows out of the configurations. The final and the most challenging one will be changing the mindset of developers to “not create workflows and business objects but write code which can generate”. A join point is an identifiable point in the execution of a system. The model defines which join points in a system are exposed and how they are captured. To implement crosscutting functionality using aspects, you need to capture the required join points using a programming construct called a pointcut. Pointcuts select join points and collect the context at selected join points. 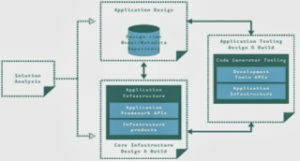 All AOP systems provide a language to define pointcuts. The sophistication of the pointcut language is a differentiating factor among the various AOP systems. The more mature the pointcut language, the easier it is to write robust pointcuts. Signature-based pointcuts cannot capture the join points needed to implement certain crosscutting concerns. For example, how would you capture join points requiring transaction management or authorization? Nothing inherent in an element’s name or signature suggests transactionality or authorization characteristics. The pointcut required in these situations can get unwieldy. The example is in AspectJ but pointcuts in other systems are conceptually identical. Situations like these invite the use of metadata to capture the required join points. For example, you could write a pointcut as shown below to capture the execution of all the methods carrying the @Transactional annotation. AOP systems and their join point models can be augmented by consuming metadata annotations. By piggybacking on code generation support it’s possible to consume metadata even when the core AOP system doesn’t directly support it. To support metadata-based crosscutting, an AOP system needs to provide a way to consume and supply annotations. An AOP system that supports consuming annotations will let you select join points based on annotations associated with program elements. The current AOP systems that offer such support extend the definition for various signature patterns to allow annotation types and properties to be specified. For example, a pointcut could select all the methods carrying an annotation of type Timing. Further, it could subselect only methods with the value property exceeding, say, 25. To implement advice dependent on both annotation type and properties, the system could include pointcut syntax capturing the annotation instances associated with the join points. Lastly, the system could also allow advice to access annotation instances through reflective APIs. Many business applications require the user interface (UI) to be extensible as the requirements vary from one customer to another. Client-side business logic for the UI may also need customization based on individual user need. A screen layout for a user might be different from another user. This may include control position, visibility, UIs for various mobile devices. The business logic customization also includes customizing validation rules, changing control properties, and other modifications. For example, a manager may have different options for deleting and moving files than a subordinate. There are many techniques for enabling business applications to be extensible or customizable. Most applications solve this problem by storing customizable items such as UI layout and client-side business logic as metadata in a repository. This metadata can then be interpreted by a run-time engine to display the screen to users and to execute the client-side business logic when the user performs an action on the screen. Redeployment of components on the presentation layer is not required as the customization is done in a central repository. A very light client installation is required. One only needs to deploy the run-time engine to the client machine. Multi-tenancy in cloud applications can have a huge impact on the application delivery and productivity of an IT company. Yet most people who use cloud and its services tend to ignore it owing to it’s “behind the scenes” functionality. Many old applications have been written in multitenant manner but moving them to SAAS or converting legacy to SOA might become a challenge. Meta data driven programming is indeed a different paradigm. However, it has a capability to solve numerous challenges associated not only with multi-tenancy but other cloud issues as well.